This is one of our favorite chicken pies. When my son would come home from a tour of duty as a Marine, this is the one thing he requested to eat every time. Place the chicken in a pot and cover with water, bring to a boil and cook thoroughly. Remove the chicken (save the cooking liquid), let cool and then chop up the meat. In a mixing bowl stir together the soup, broth, salt and pepper. Stir in the chicken, combine well. Lightly spray a 9x9 baking dish with cooking spray. Spoon half of the chicken mixture into the bottom and spread around. Then cover the mixture with a layer of the pie strips. Dot the strips with 1 T. of butter and place in a 400 degree oven for 25 minutes. Remove and spoon the remaining chicken mixture over the top, then place the remaining pie crust strips. Again, dot with 1 T. butter. Return to the oven for an additional 25 minutes or until golden brown. Remove and let sit 5 minutes before serving. 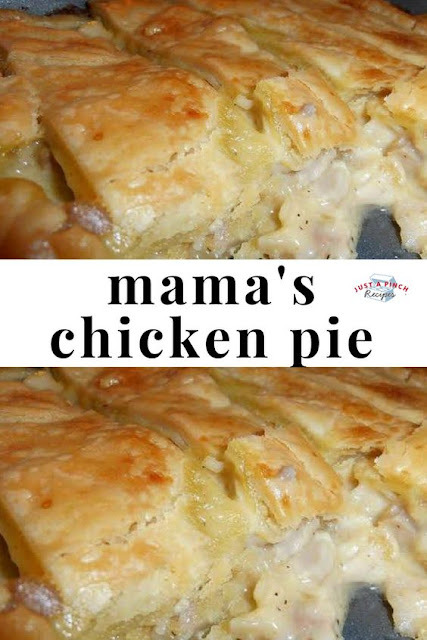 0 Response to "Mama's Chicken Pie"